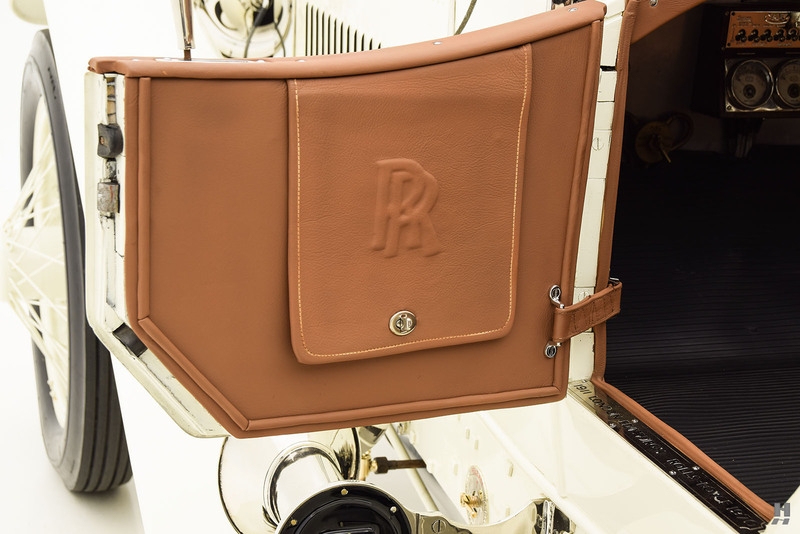 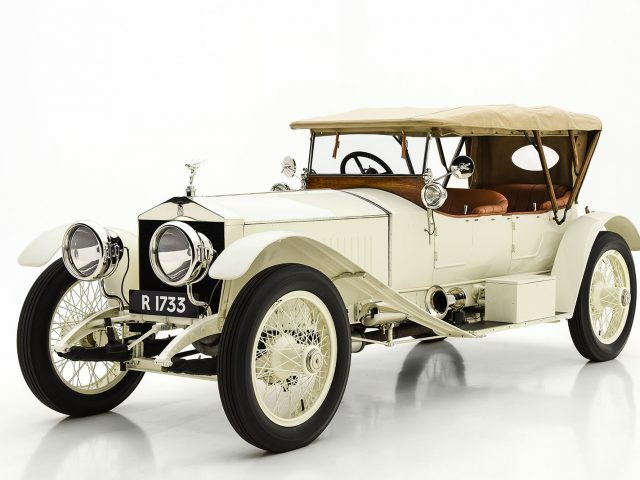 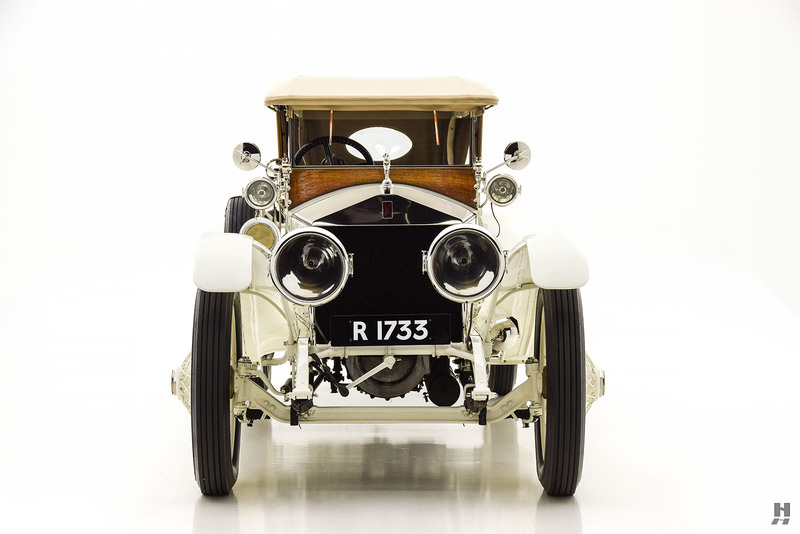 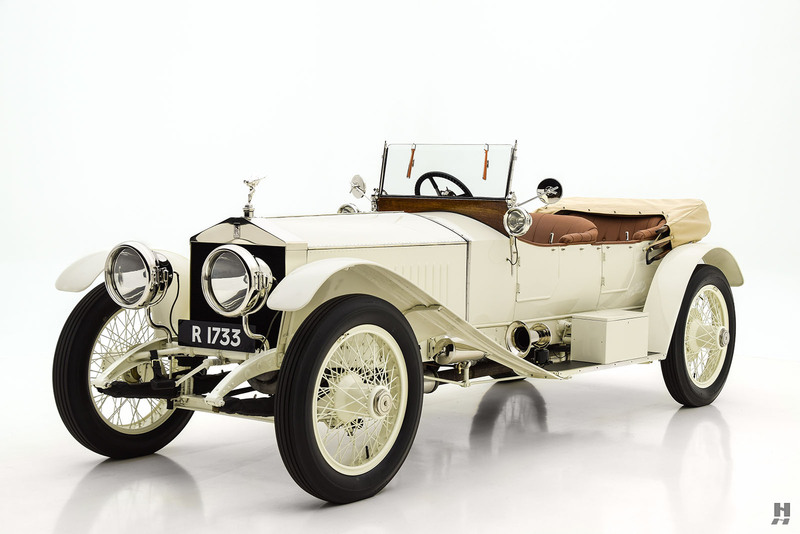 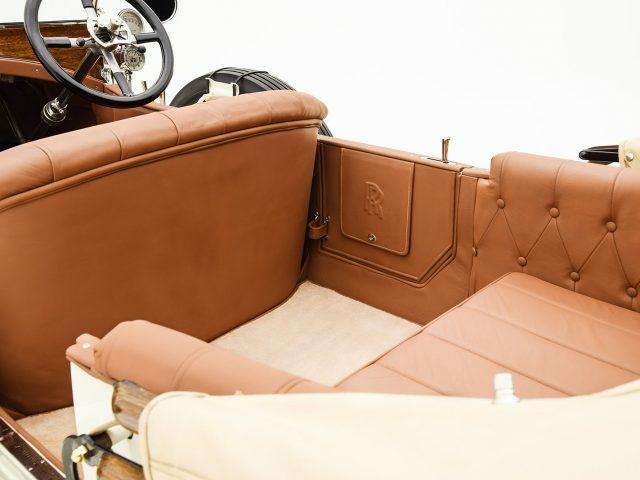 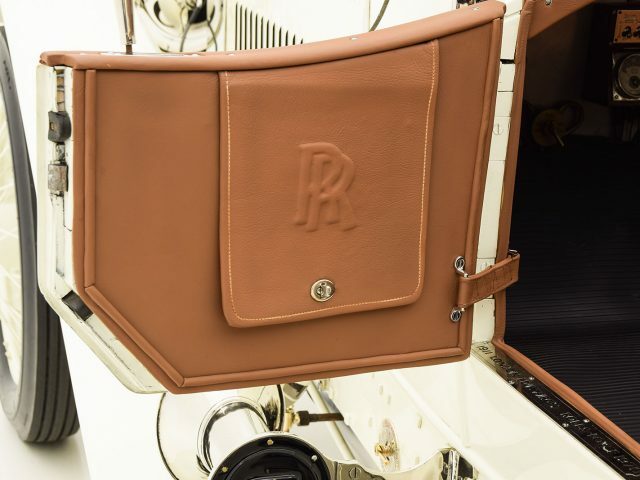 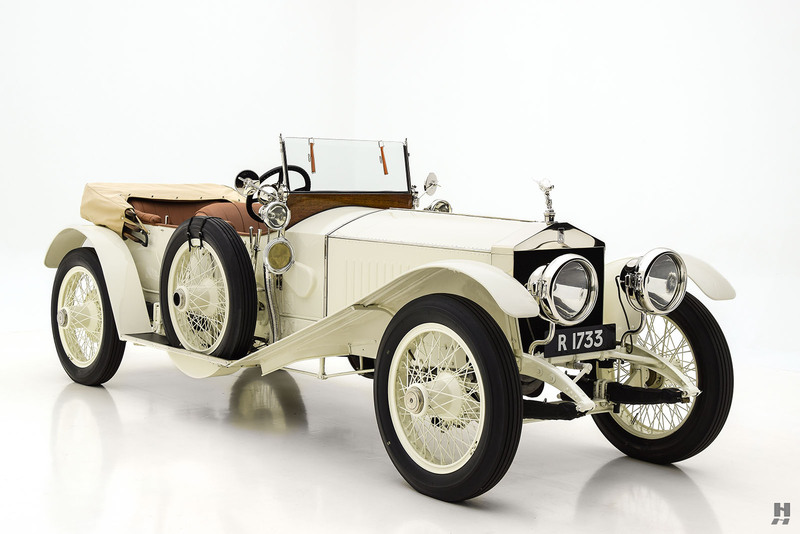 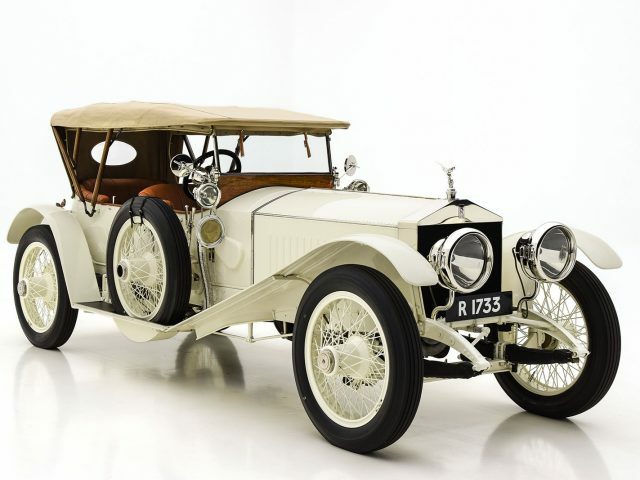 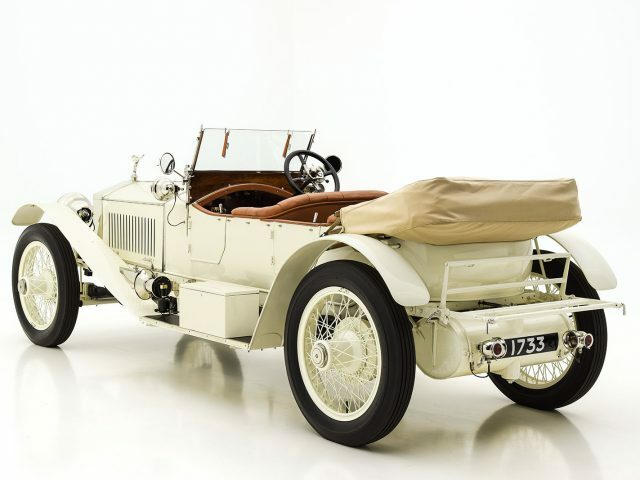 The Rolls-Royce 40/50hp “Silver Ghost” made its spectacular debut in 1907, recognized almost immediately as the finest motorcar money could buy. 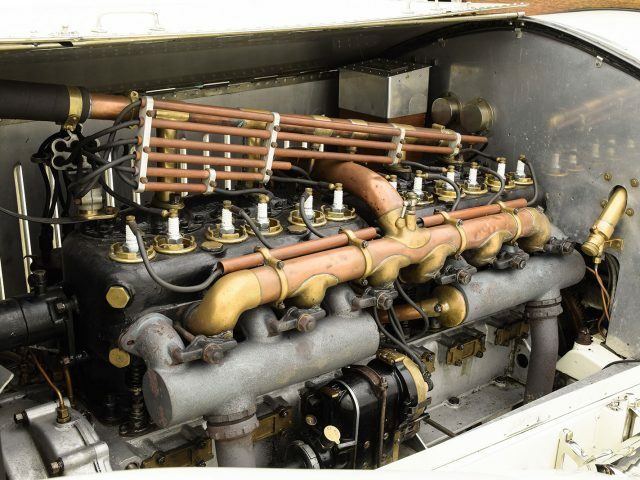 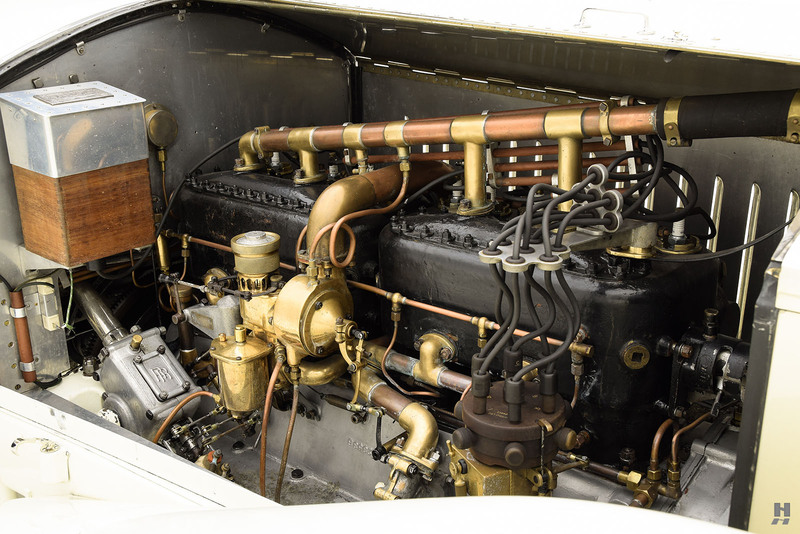 At the heart of the 40/50hp was Henry Royce’s impressively powerful and reliable 7,428cc side-valve inline-six. 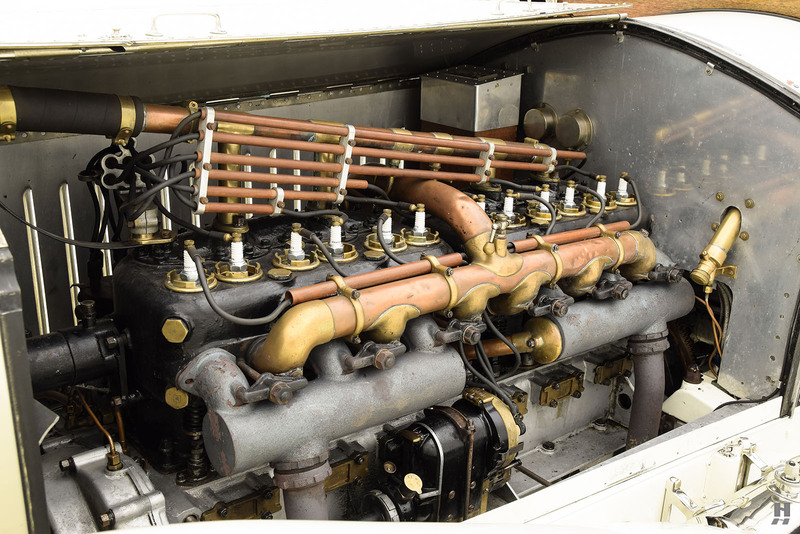 In its day, the inline-six configuration was considered a folly as competitors could not cope with the issue of long, flexing crankshafts. 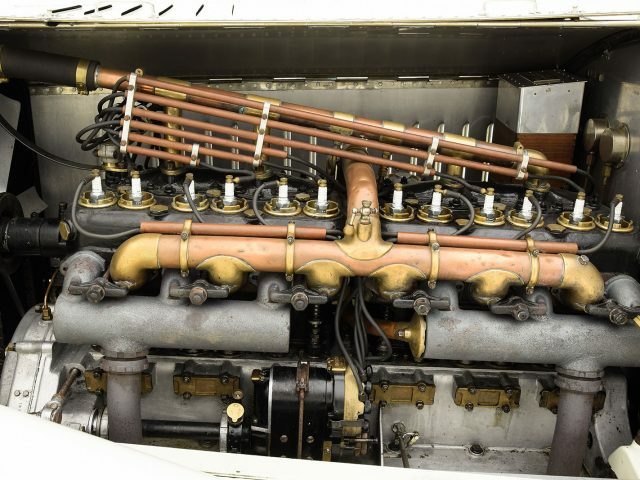 But Royce’s engine had a crank that was shorter and stronger, and which was supported by seven large main bearings. 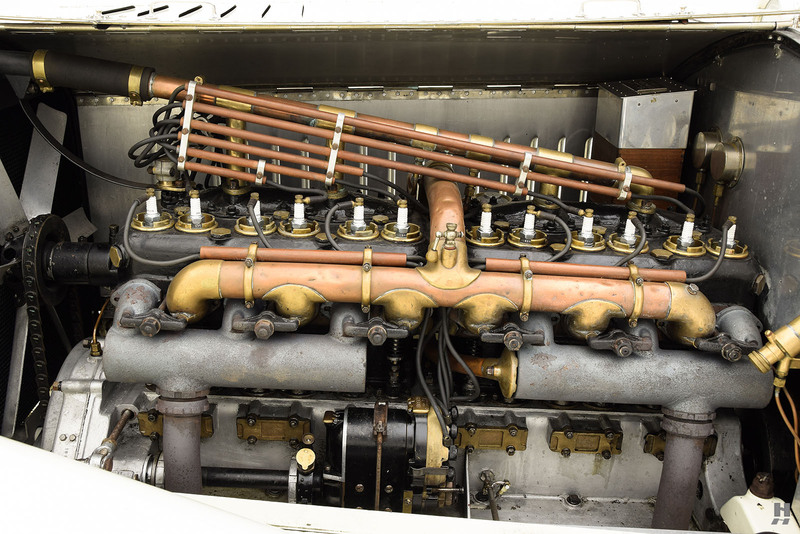 Exacting, precise machine work and hand-polishing of internal components ensured near silent, smoke-free operation – a characteristic that was virtually unheard of for the time. 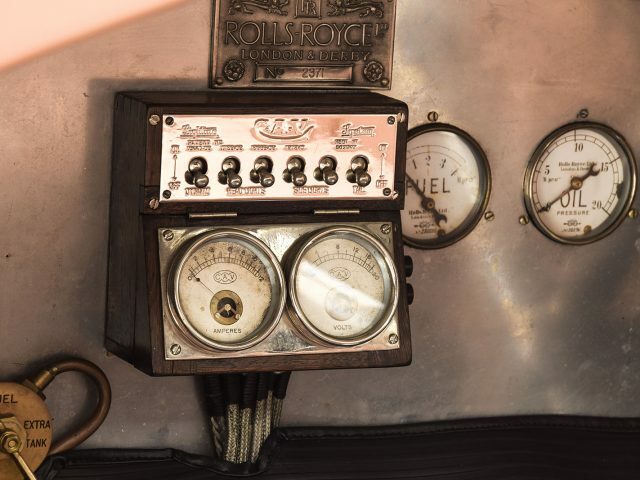 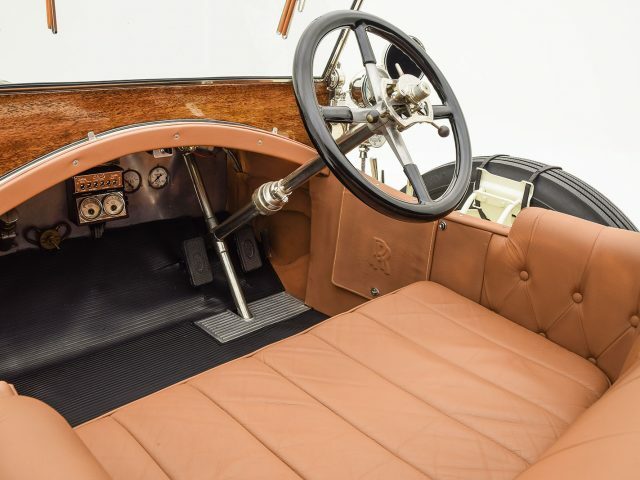 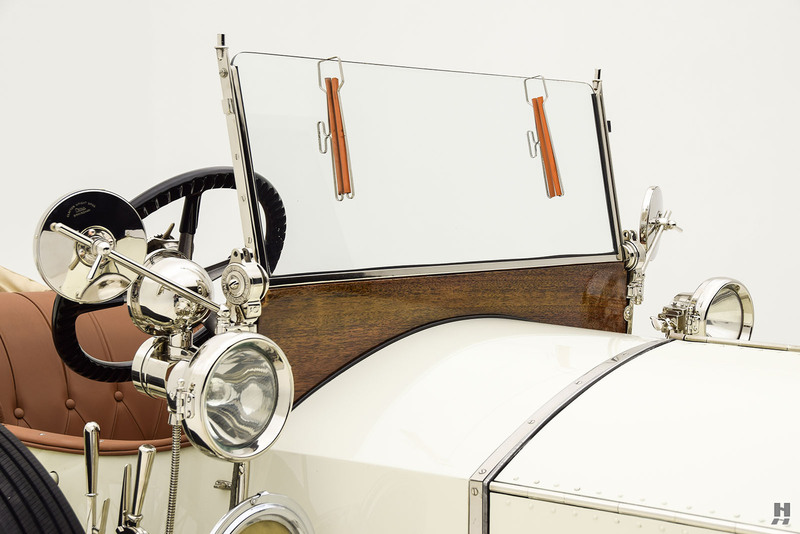 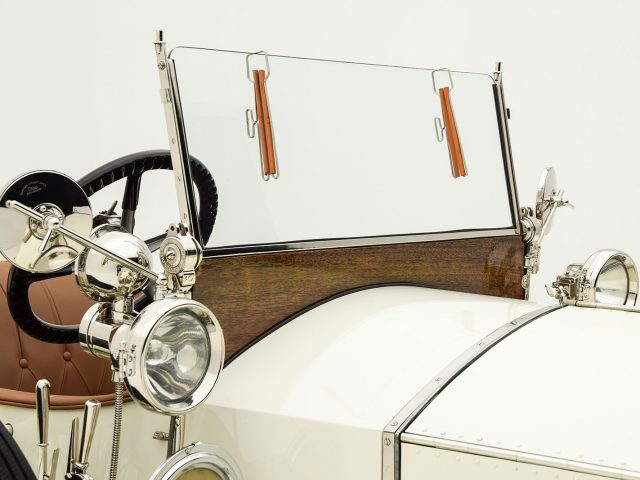 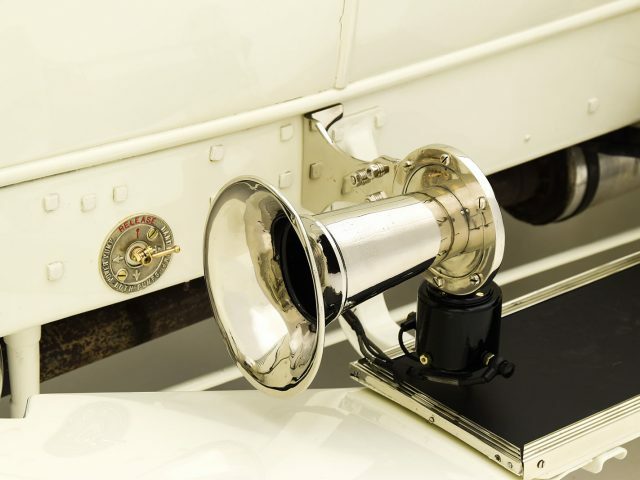 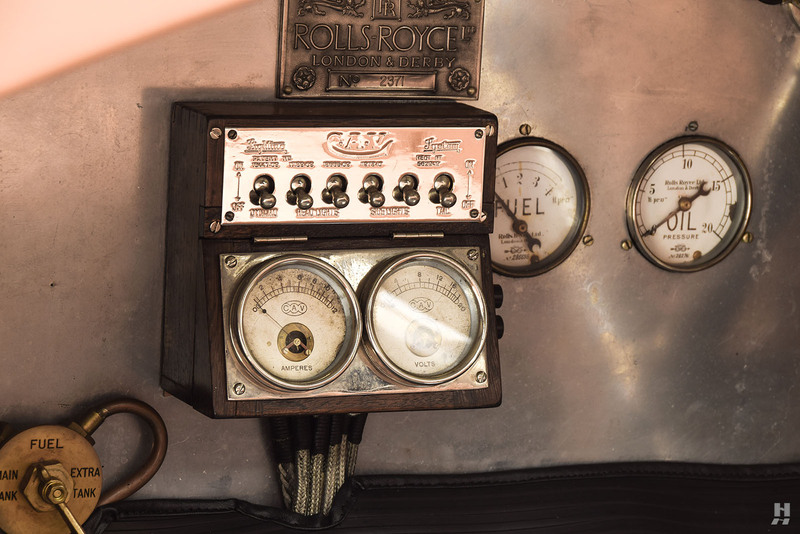 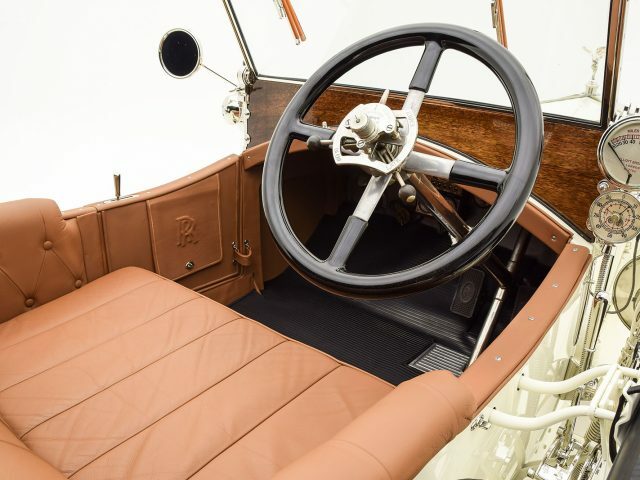 Features such as pressurized oiling, fixed heads to eliminate leaks, and a twin ignition system via magneto or distributor were advancements that established the Silver Ghost as the standard of the world for motorcars. 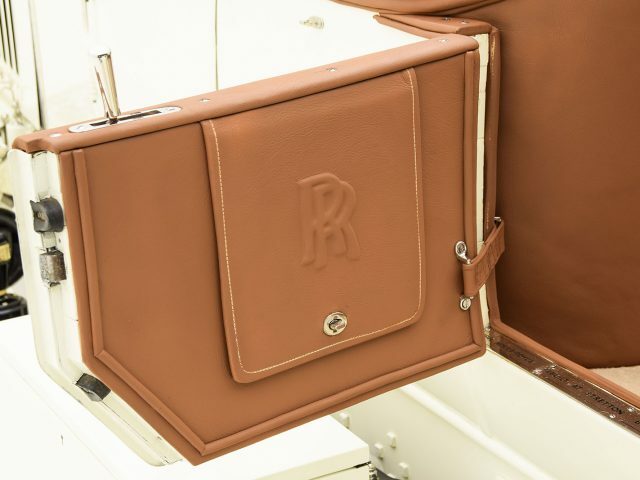 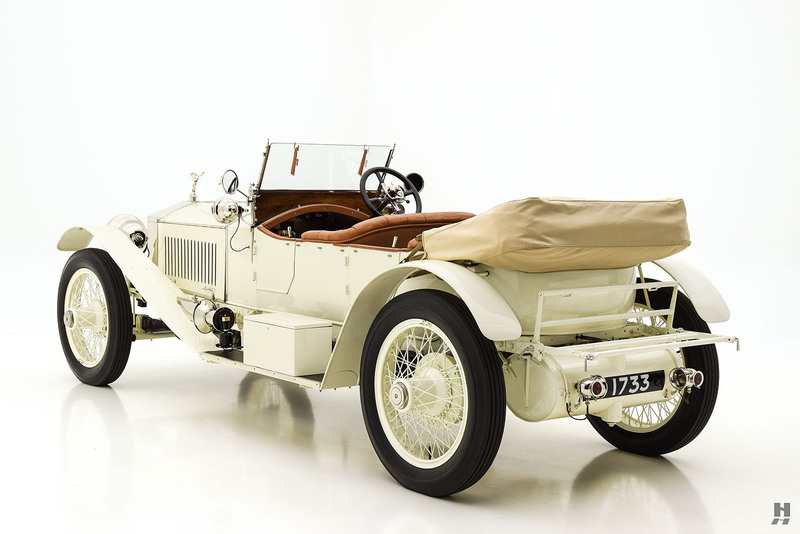 Particularly when compared to other machinery of the same period, the Silver Ghost is a true marvel of sophisticated engineering and build-quality, capable of delivering near silent operation and a luxurious experience drivers and passengers alike. 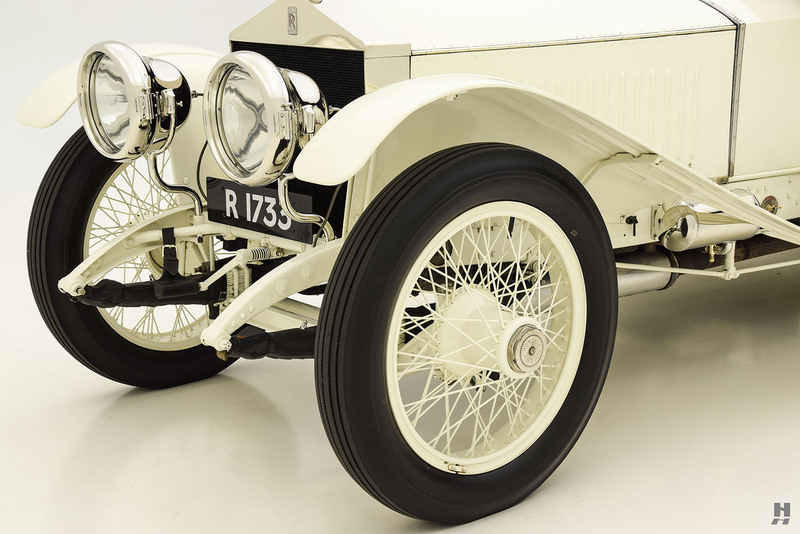 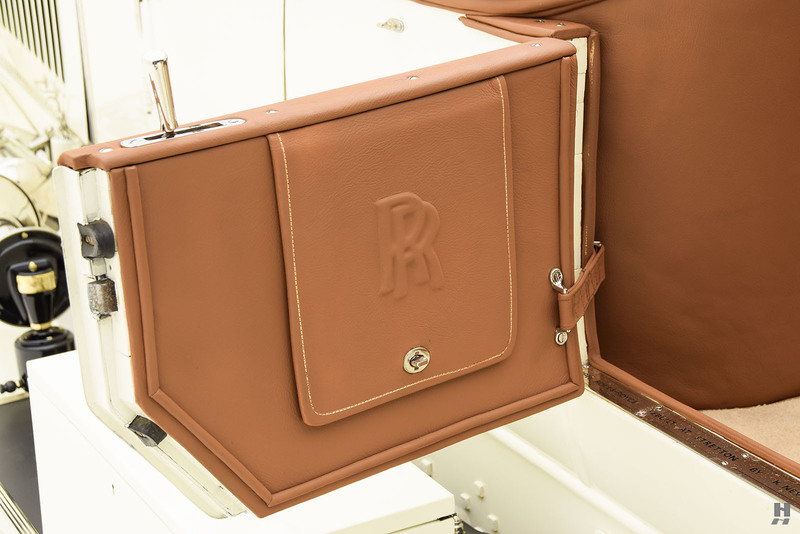 In Rolls-Royce’s early days, their chief competition came from Napier. 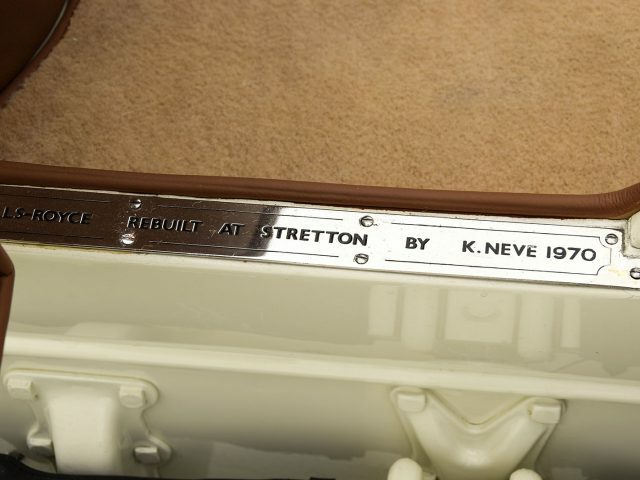 Under the directorship of S.F. 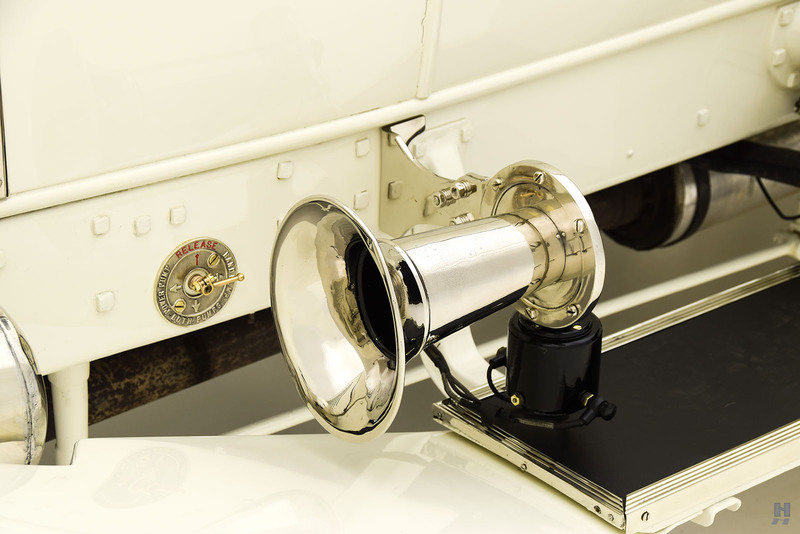 Edge, Napier had embraced the idea of the publicity stunt in order to drive sales and prove its machinery in the toughest of conditions. 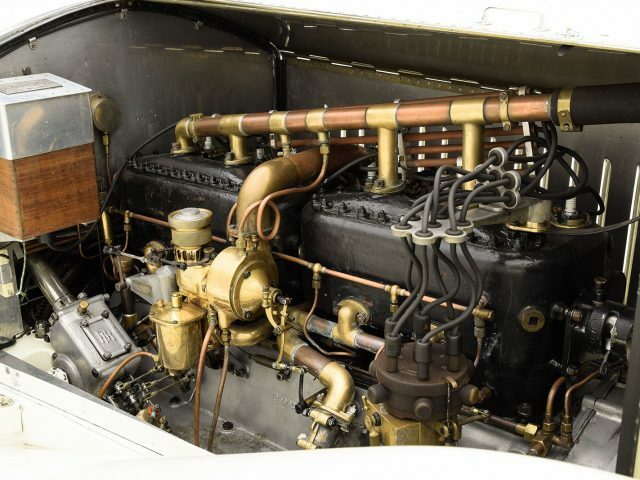 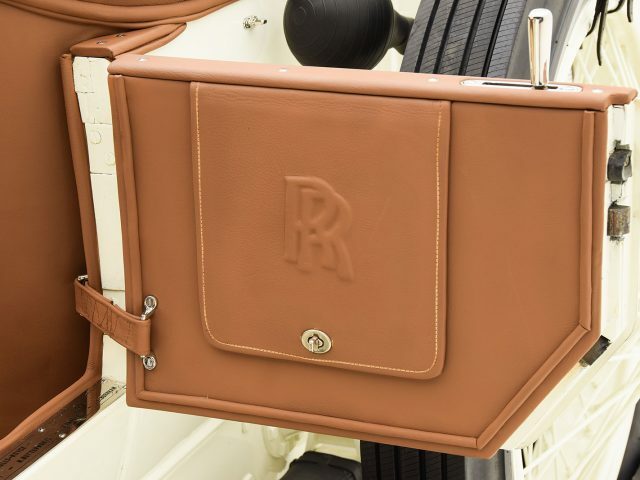 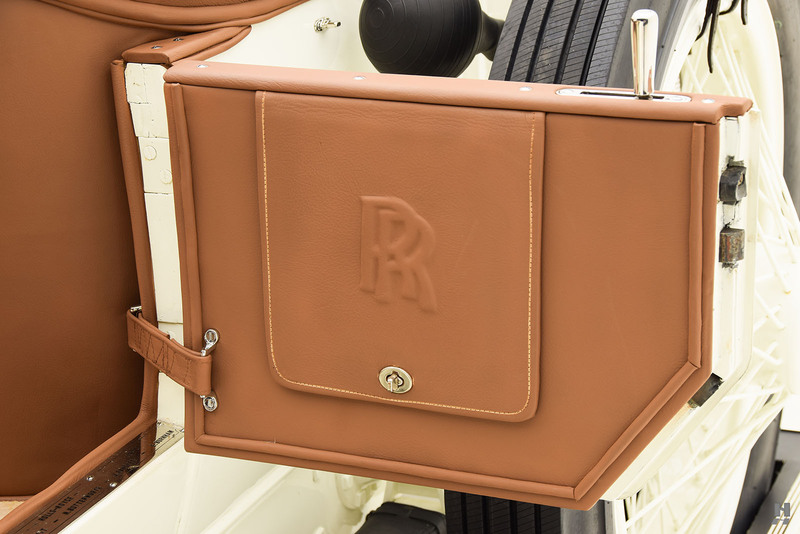 Rolls-Royce was always rather more conservative yet they relented under the pressure from their London-based rivals and in 1911, took on the RAC-sanctioned London to Edinburgh Challenge to prove they built the finest, most reliable and best performing cars in the world. 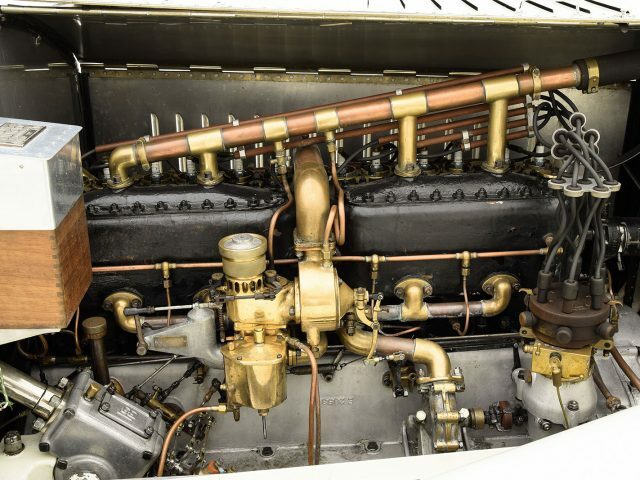 The challenge was seen as the perfect venue to showcase the latest upgrades to the 40/50hp model. 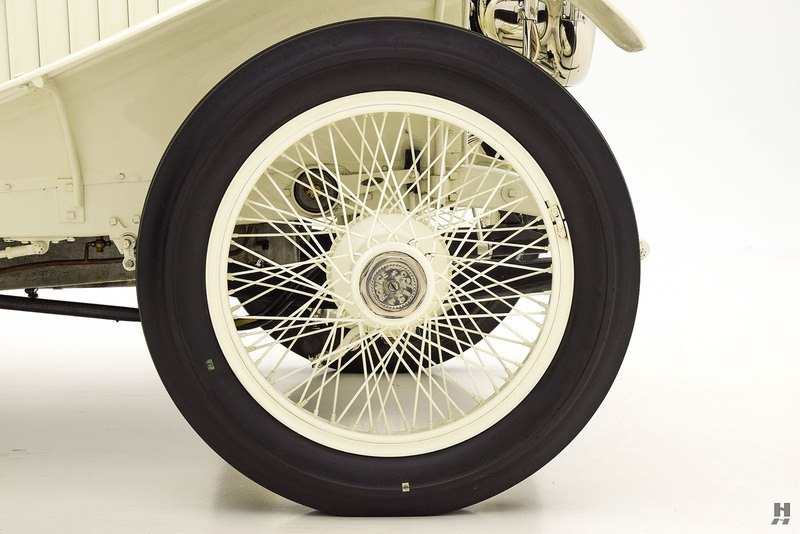 Chassis 1701 was the second such car to receive improved specification that included a massive torque tube sending power to the strengthened rear axle, larger carburetor and a higher compression ratio engine. 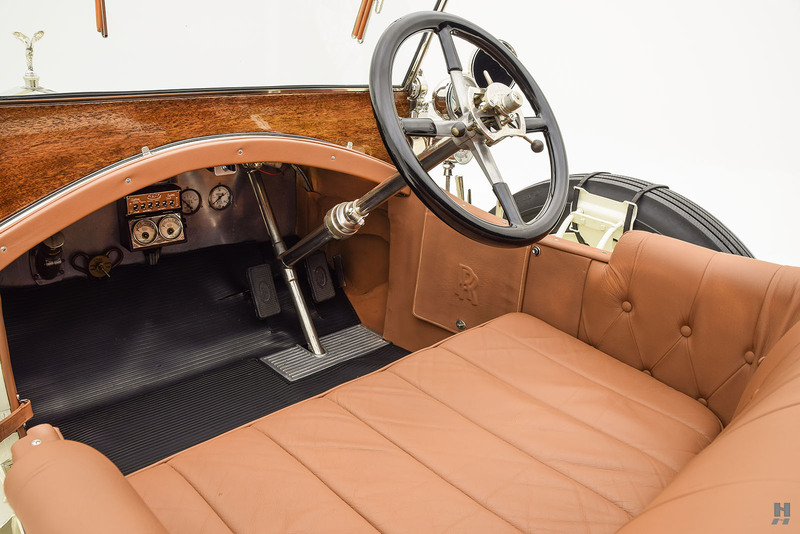 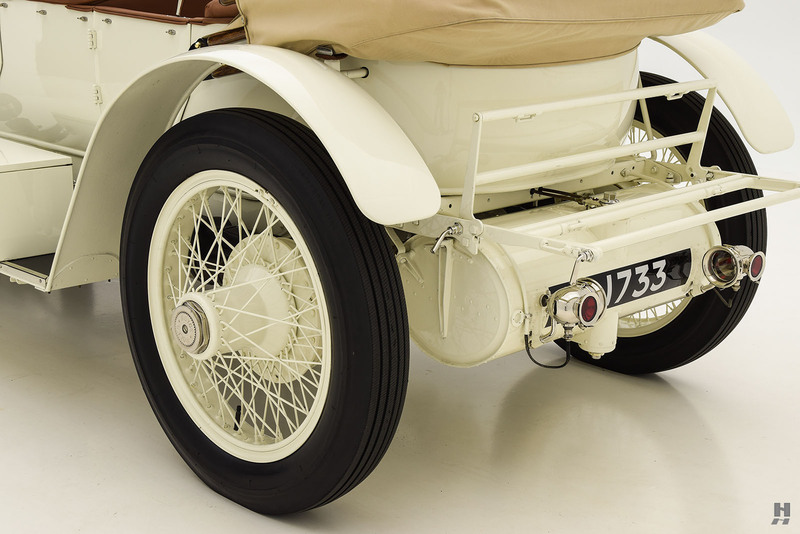 Fitted with a sporting, close coupled light-touring body by Holmes of Derby, Ltd, chassis 1701 completed the entirety of the 800 miles challenge in top gear, achieving an average consumption of 24.32 miles per gallon. 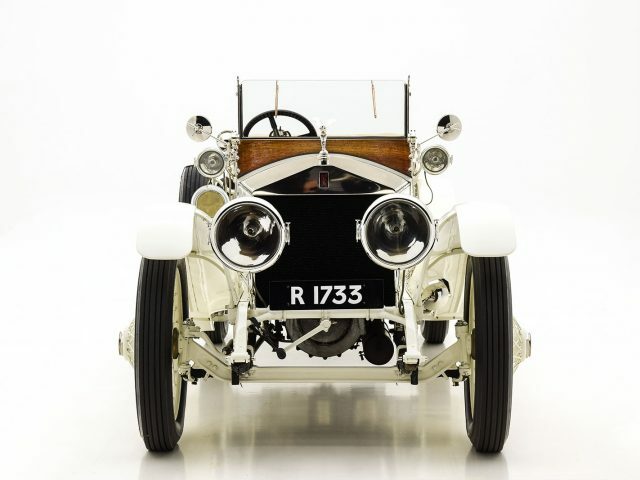 Later, that same car achieved 78.26 miles per hour at Brooklands. 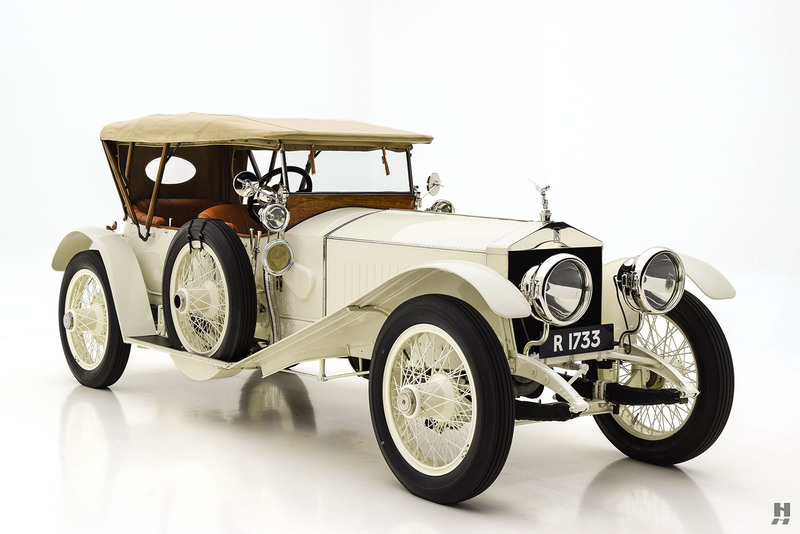 The success in the London-Edinburgh challenge led to a raft of new orders for similarly spec’d cars – heretofore known as the London to Edinburgh Ghost. 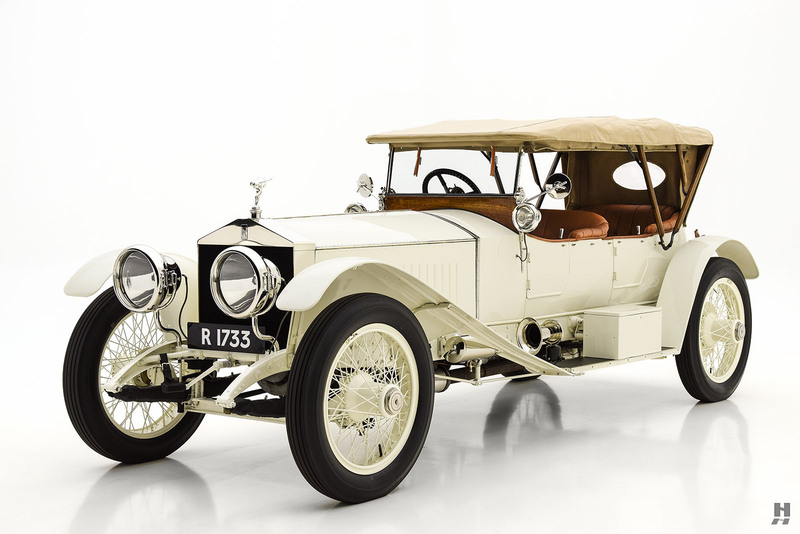 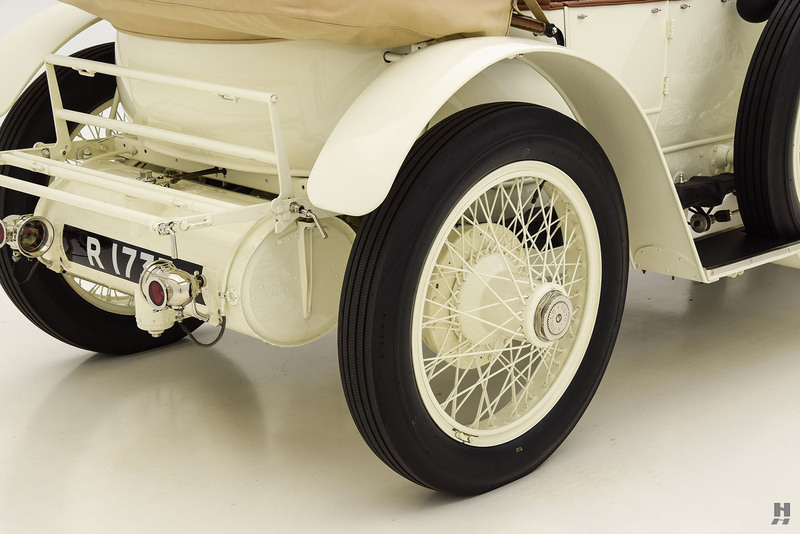 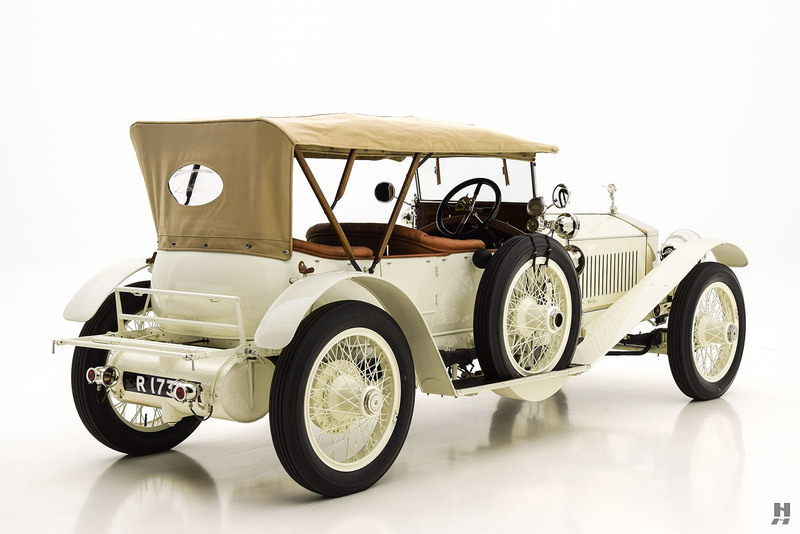 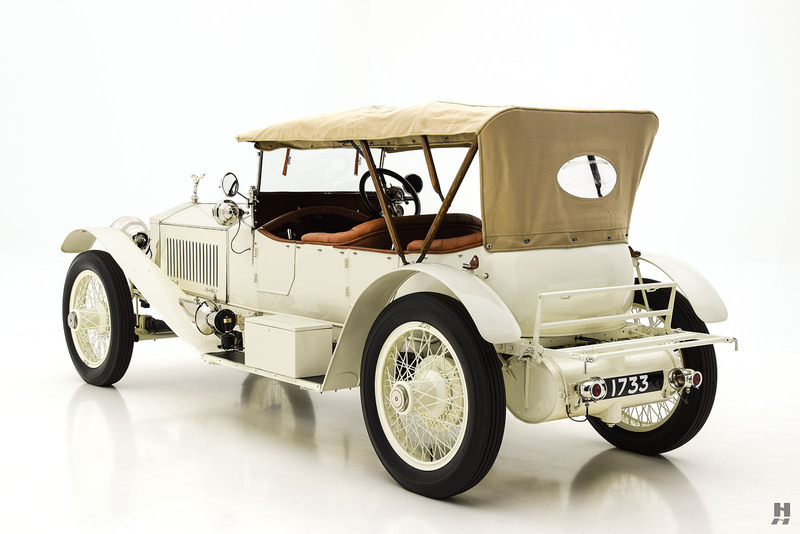 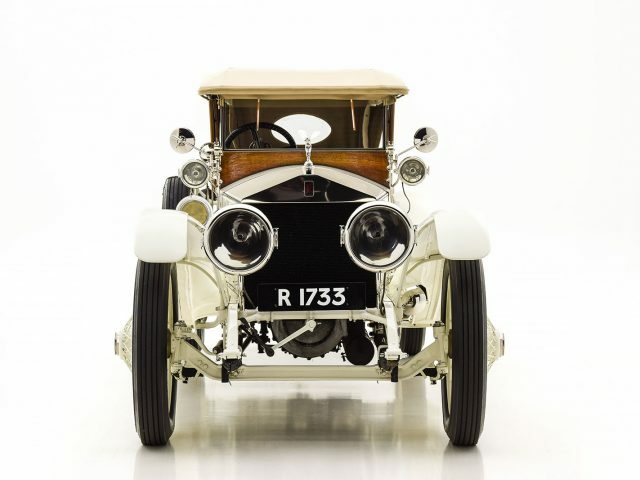 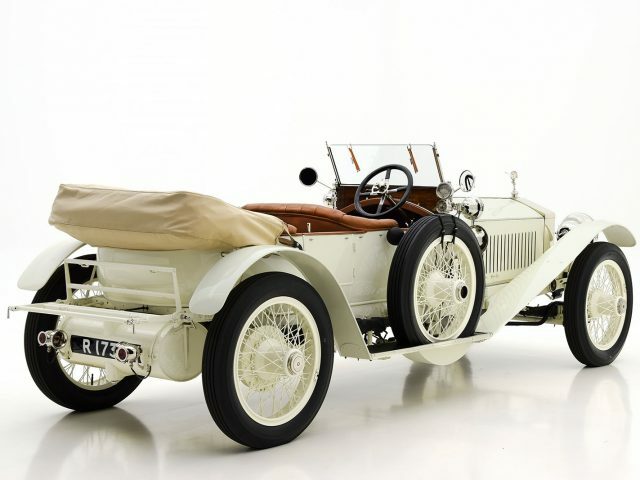 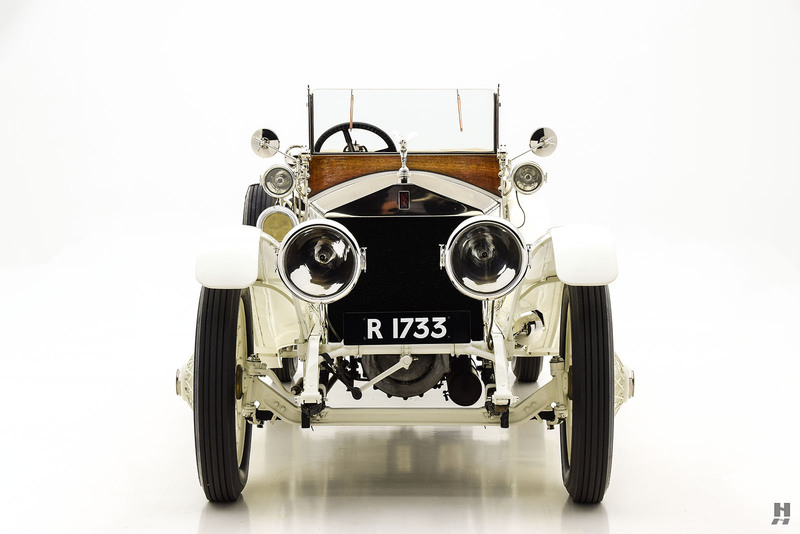 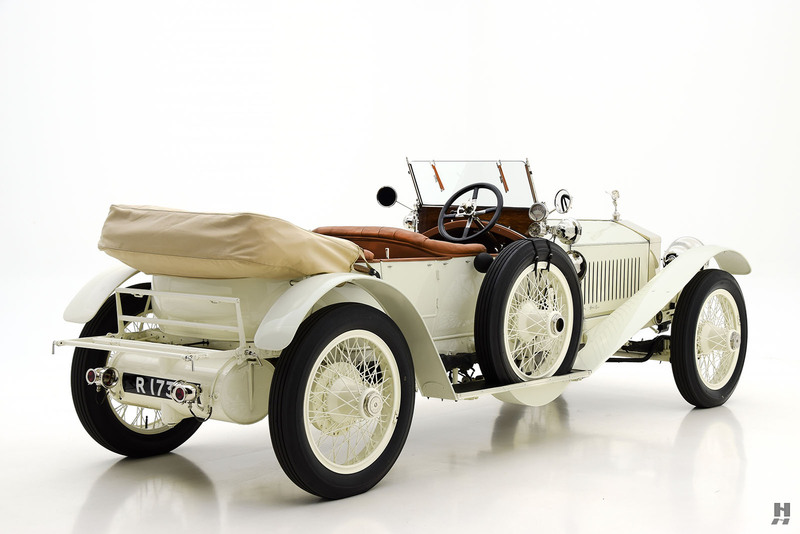 Between spring of 1912 and October of 1913 (ending with chassis 2699) just 188 examples were built – a mere fraction of the total Silver Ghost production of 6,700 cars. 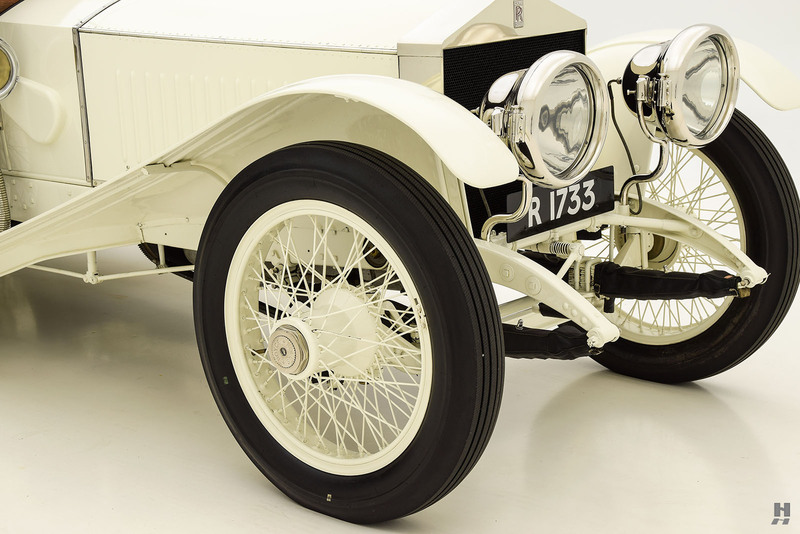 Our featured 1913 40/50hp Silver Ghost, chassis number 2371, is one of these coveted London-Edinburgh specification cars. 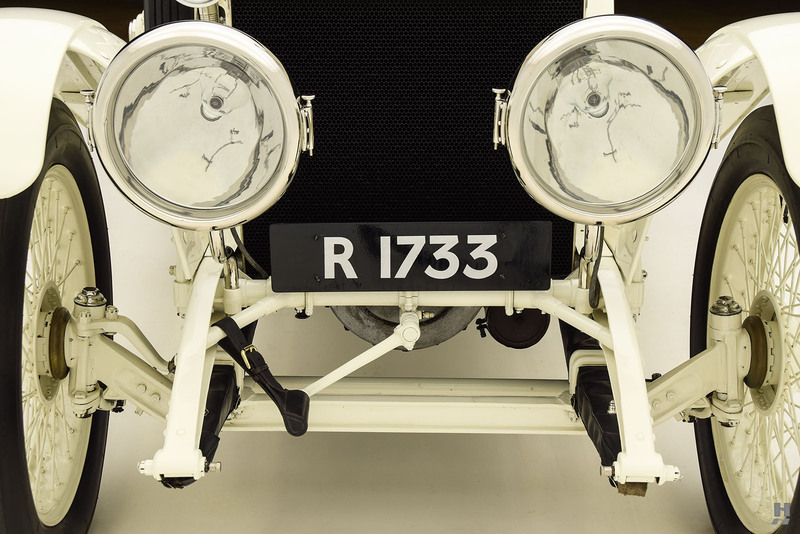 Original build sheets indicate this car was a direct copy of chassis 2148, which in itself was a direct copy of the famous “1701” works car. 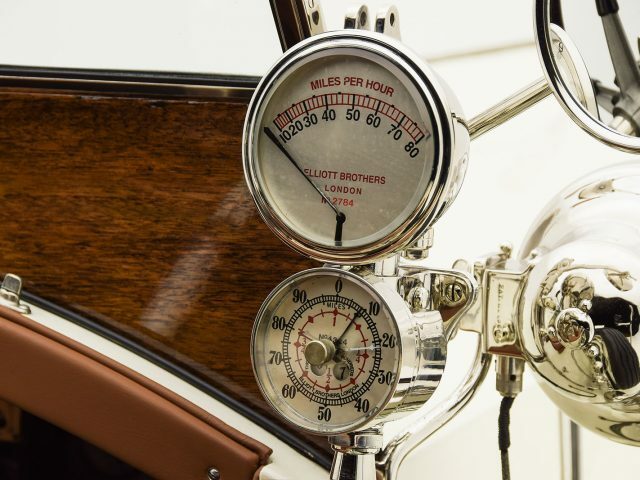 Originally clothed in a popular Torpedo style body by Barker, 2371 was delivered new to one Albert Janesich of the illustrious Janesich Jewelry family. 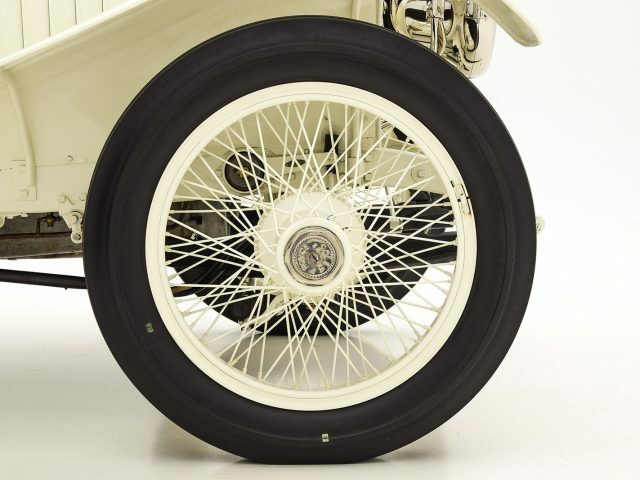 Highly detailed notes on the factory build sheets indicate it was specified with Rudge-Whitworth wire wheels, Dunlop grooved tires, C.A. 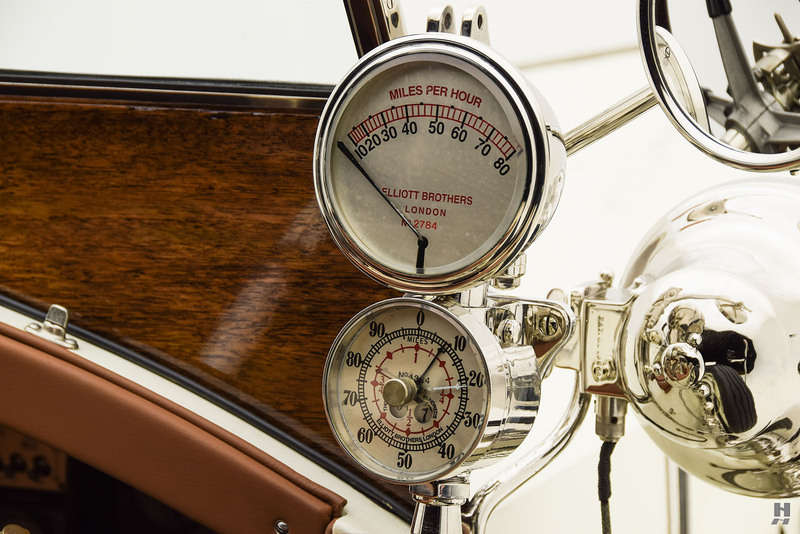 Vandervell lighting, multiple Brooks trunks, cobra horn, speedometer calibrated in KM and an additional clock. 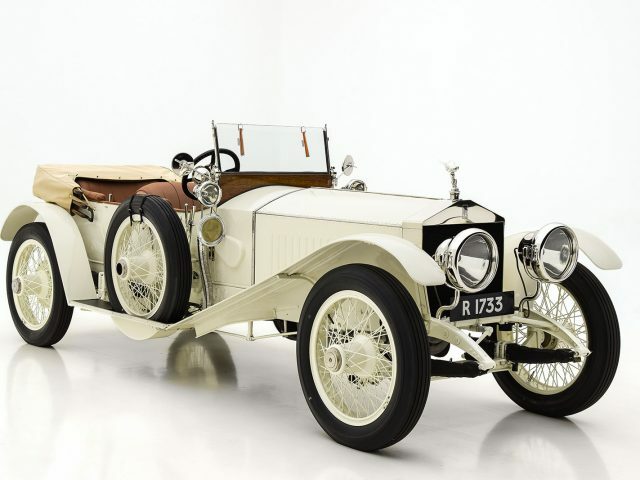 Janesich’s fabulous new Rolls-Royce was briefly registered in the UK, though very soon sent across the channel to Paris. 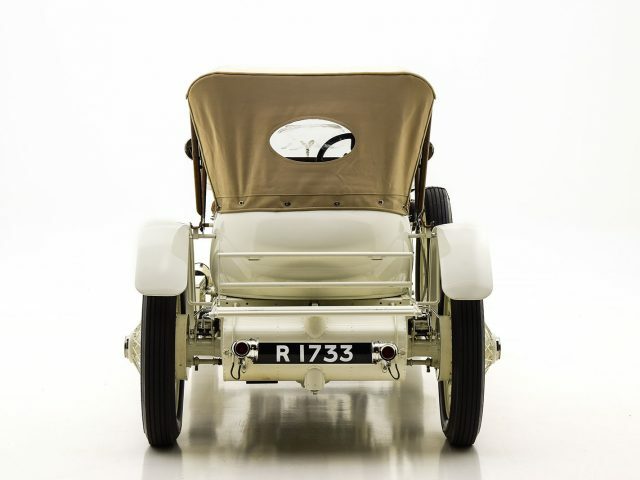 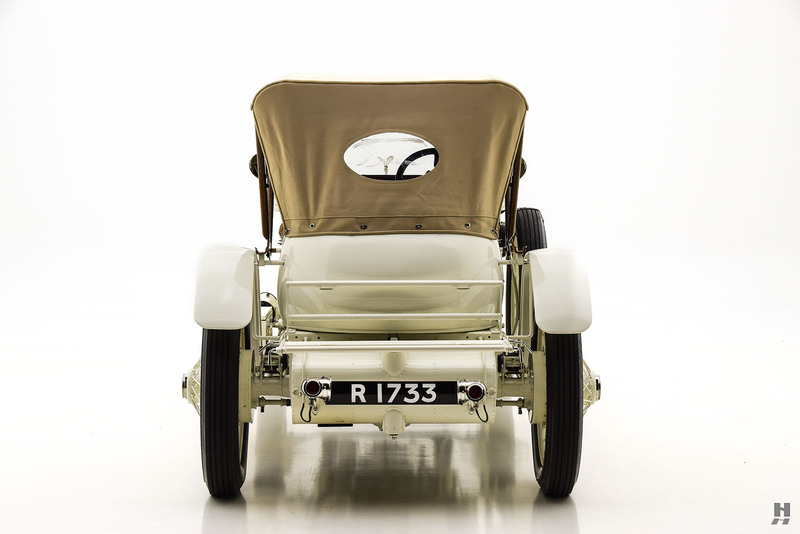 Originally finished in silver gray with ivory lines and upholstery, it would have no doubt been a striking machine to see motoring the streets of Paris in its day. 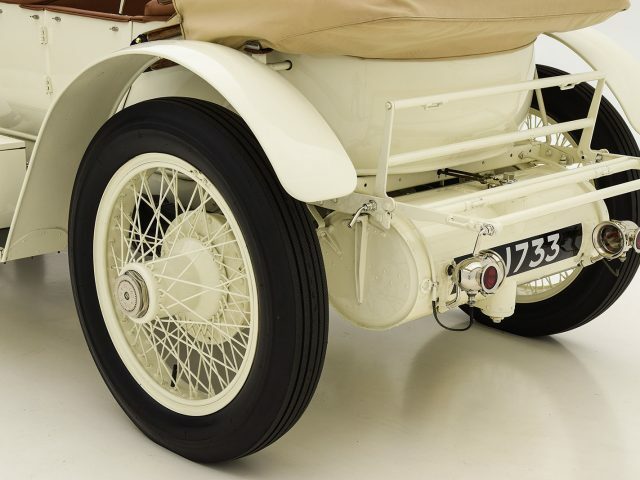 A small accident necessitated a return to the factory for a comprehensive rebuild in 1927, though from there the trail of the history is temporarily lost. 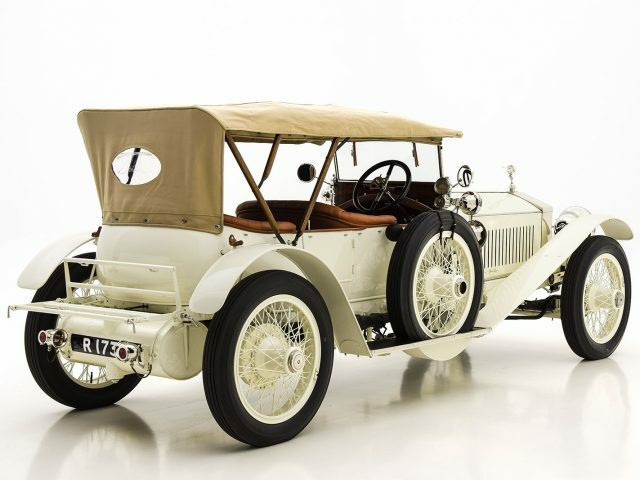 As with many such cars living in Europe, 2371 was most likely dismantled and hidden from the Germans during WWII. 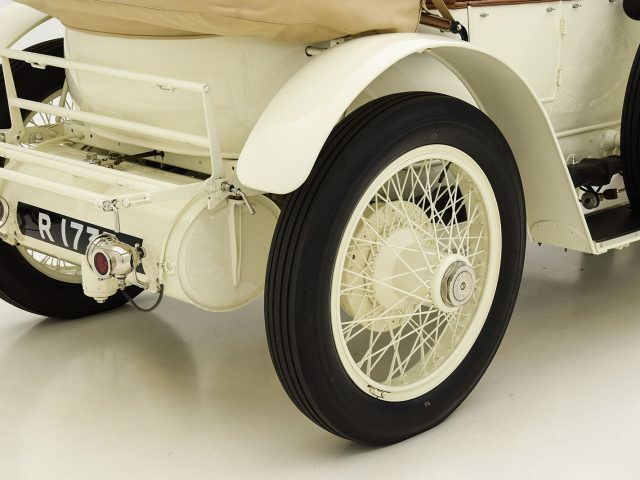 It wasn’t until the 1990s when the chassis was discovered in Paris by two enthusiasts who were tipped off to the possible existence of a Silver Ghost in the city. 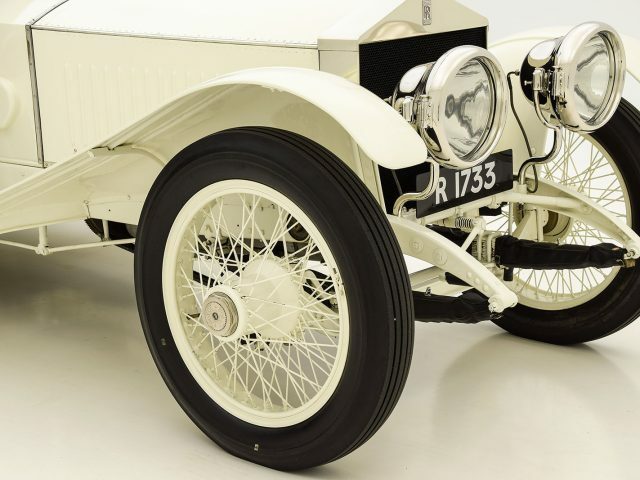 Following its discovery, the chassis would pass to a noted marque enthusiast Walter Wilson of Ireland who, working with James Black, would commission a comprehensive rebuild. 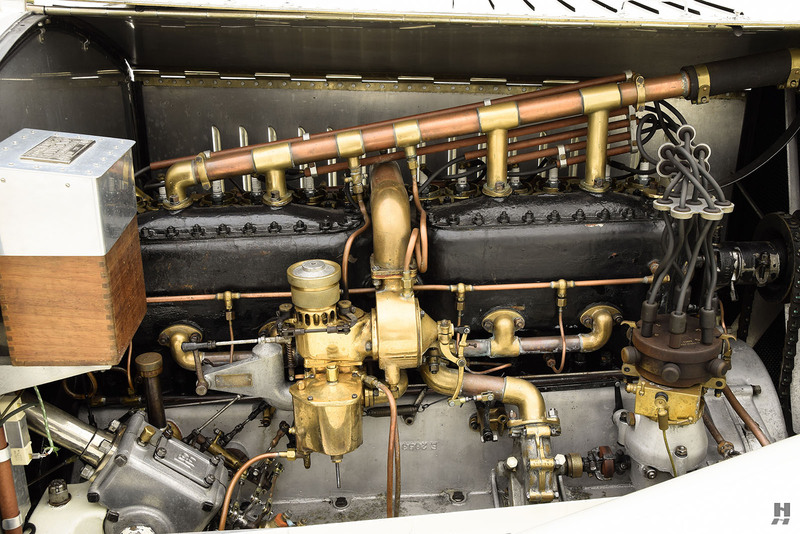 The original engine had long since been missing, so Wilson and Black found a comparable spec unit from 1914 carrying the number 10 K. Interestingly, the body that 2371 wears today was once fitted to the original works London-Edinburgh chassis; 1701 having been fitted with the body by Kenneth Neve in 1970. 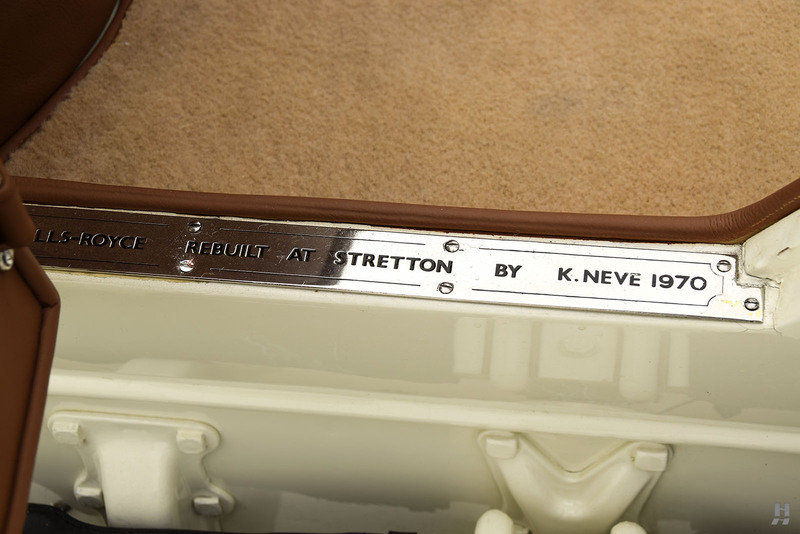 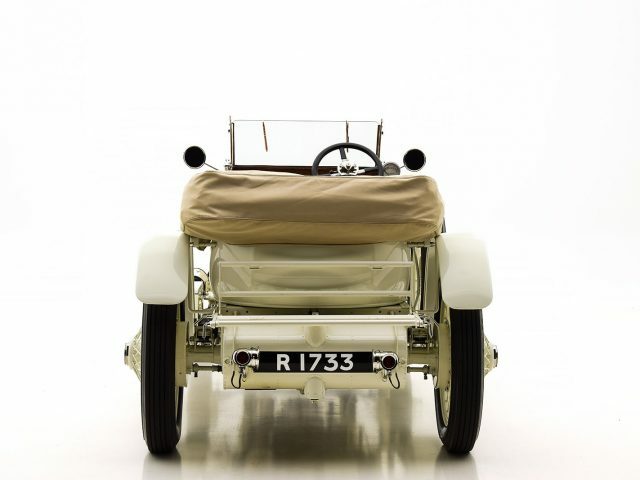 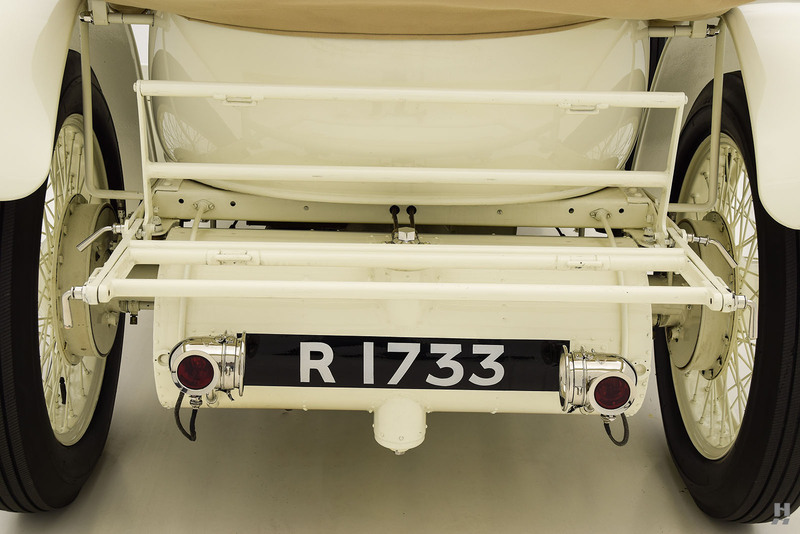 A later restoration of 1701 made that body available, becoming a fine match for our chassis 2371. 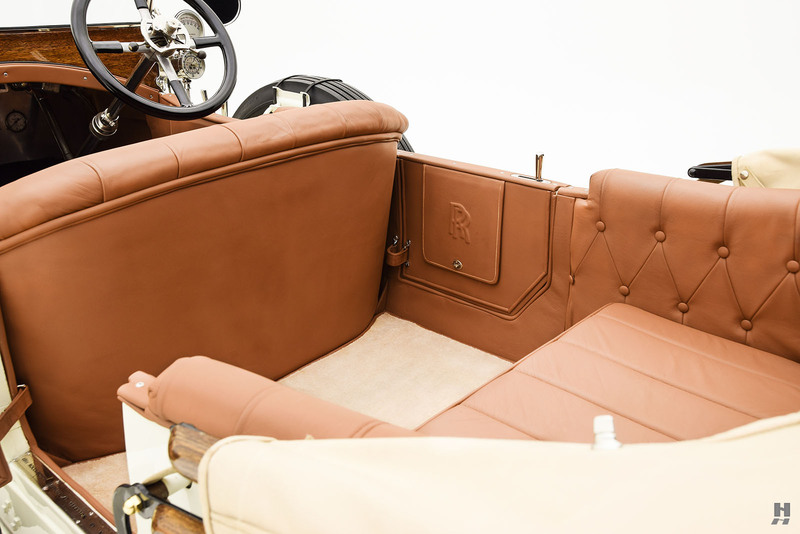 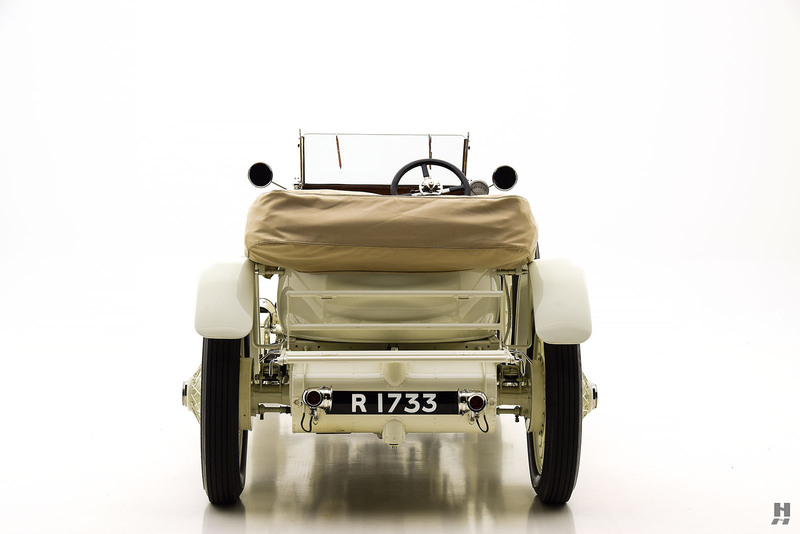 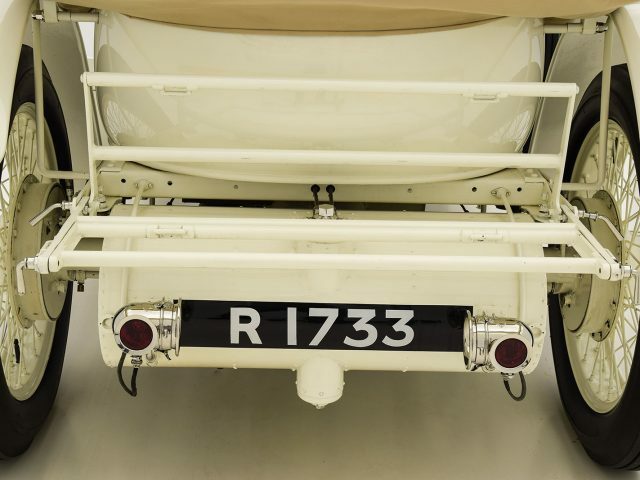 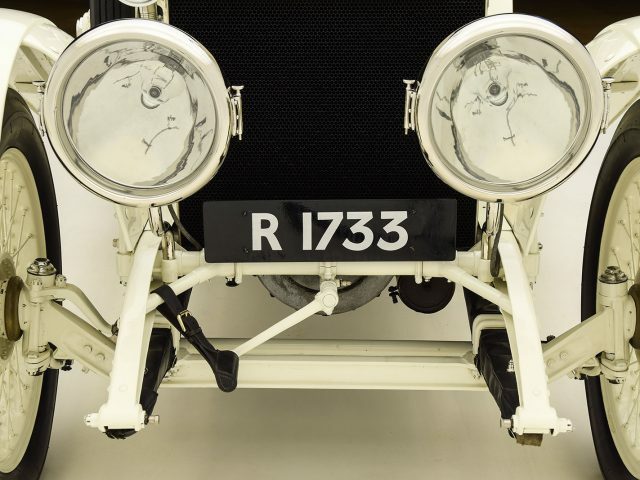 As a finishing touch to the restoration, the original 1913 British registration number – R 1733 – was officially returned to the car. 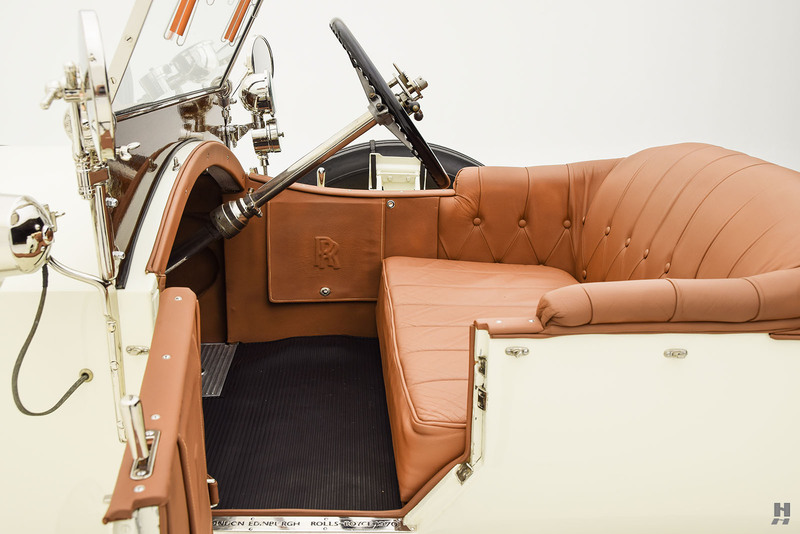 Walter Wilson thoroughly enjoyed his restored Ghost for the next two decades before passing it to the most recent owner in 2014. 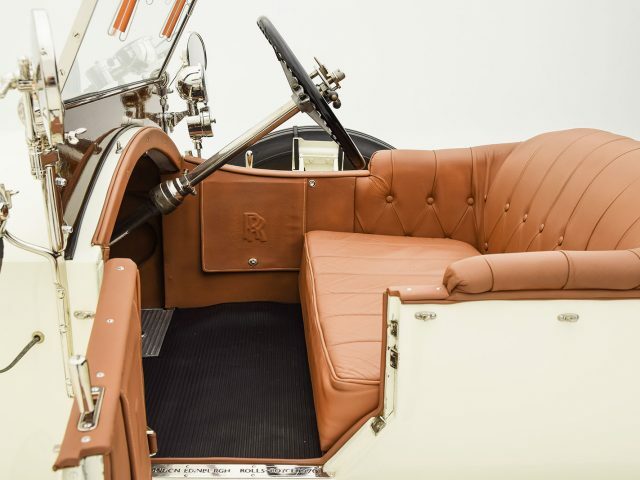 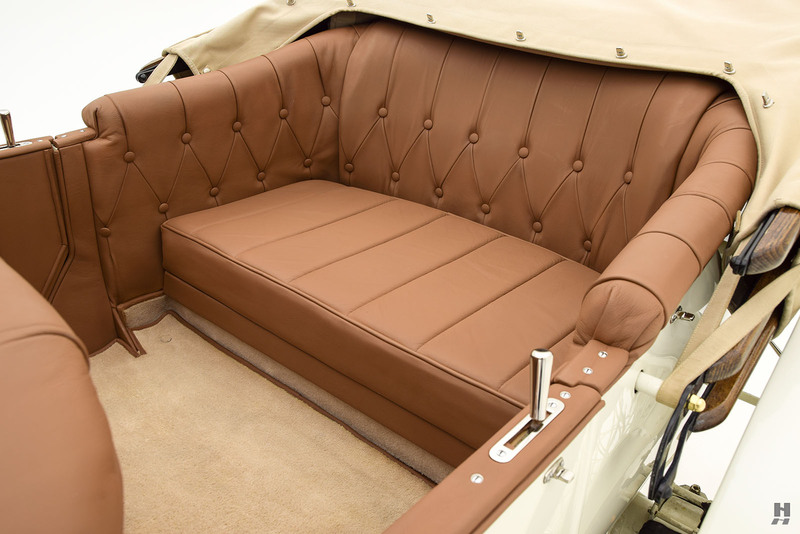 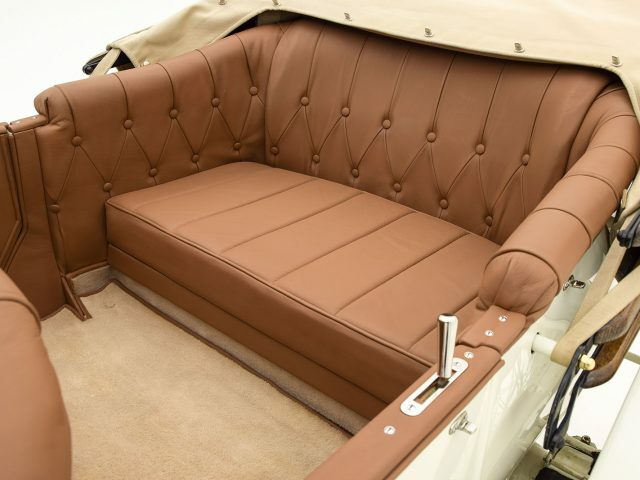 It is currently presented in white with tan leather upholstery and beautiful nickel plated fittings and it has a delightfully low-slung and sporty appearance, particularly riding on the correct spec Rudge Whitworth wire wheels. 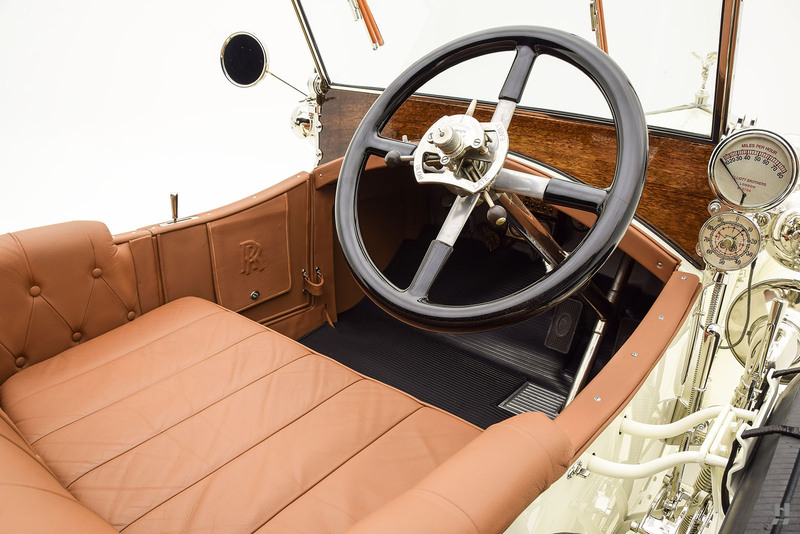 The restoration has held up extremely well; with an inviting, broken-in appeal thanks to Mr. Wilson’s time spent enjoying his motorcar. 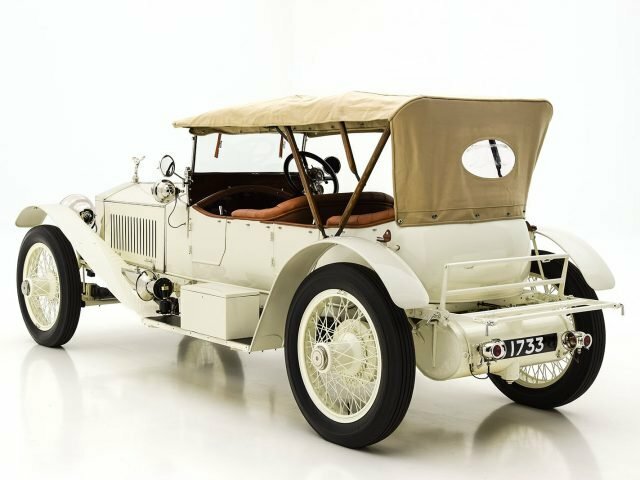 The car remains mechanically sound and would make the ideal companion for long-distance touring as it was originally intended. 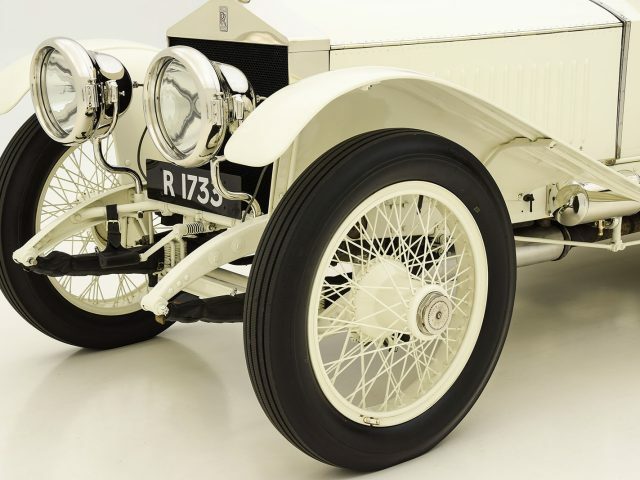 Mechanically and cosmetically sound, and with a fascinating history documented via build sheets as well as within the pages of the respected reference work “The Edwardian Rolls-Royce”, chassis number 2371 is a well-known, delightfully attractive and usable example of this highly desirable model.